If you notice any of these symptoms, let your pediatrician know as soon as possible. Your pediatrician may recommend an overnight sleep study called a polysomnogram. Overnight polysomnograms are conducted at hospitals and major medical centers. During the study, medical staff will watch your child sleep. Several sensors will be attached to your child to monitor breathing, oxygenation, and brain waves (electroencephalogram; EEG). Many children with sleep apnea have larger tonsils and adenoids. The most common way to treat sleep apnea is to remove your child's tonsils and adenoid. This surgery is called a tonsillectomy and adenoidectomy. It is highly effective in treating sleep apnea. Children born with other medical conditions, such as Down syndrome, cerebral palsy, or craniofacial (skull and face) abnormalities, are at higher risk for sleep apnea. Children with these conditions may need additional treatments. 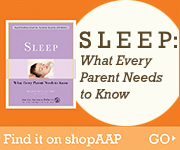 Overweight children are also more likely to suffer from sleep apnea. Most overweight children will improve if they lose weight, but may need to use CPAP until the weight is lost.